How to turn water OFF to your irrigation system ONLY. Welcome to Heads Up Sprinkler Company in Plano TX. We focus on Landscape water use and how best to manage automatic landscape sprinkler systems. We provide Long Term Care, System Maintenance, and Retro Fits. 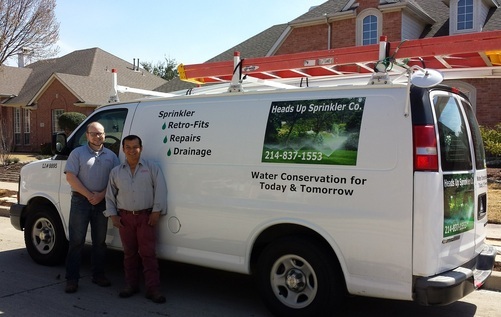 ​Heads Up Sprinkler Co. provides lawn sprinkler repairs, modifications for reworked landscaping, system updates and water conservation retro-fitting products for sprinkler systems. We work on Rainbird, Weathermatic, Toro, Irritrol, Hunter, Orbit, and Hardie systems. On our vehicles, we CARRY all the PARTS needed to repair your sprinklers. Over time, your sprinkler system has probably had some heads replaced; plants removed, added or replaced; garden areas enlarged or reduced; plants have grown; and fence lines have changed -- all sorts of landscaping changes. This has affected how efficiently and effectively your system delivers waters. Heads Up can help improve your sprinklers. ​Plano, McKinney , Allen, Fairview --- call us. We've been in the green industry since 1995 and focus on saving water and money for our customers, while helping to deliver healthy yards and plant beds and correcting leaks & water waste. AN INFORMED USER OF WATER USES LESS WATER!! We have licensed irrigation professionals on all our service teams. ​We are Pro-Installers for Rachio and carry Gen 3 on all our trucks.